Mark and his Donkeys (Billy and Danny) were a delight when they came to our Sure Start Open Day yesterday. Danny and Billy were the most beautiful Donkeys we had ever seen!! Clean, pretty and perfectly behaved. The children had a wonderful time and Mark was so lovely with them all. We especially like that Mark asked all the children to pat Danny and Billy and say "Thank you" to the Donkeys when they got off. Hi Mark what a wonderful donkey experience for all our children in early years a memory created for life.Billy and Dillon will be the topic of conversation for many months to come.Thank you Mark it was a brilliant day. Fantastic time at the beach near the Pleasure Beach... Excellent fun for the kids and how well looked after Mark's donkey's are... A real credit to you and your staff. Thanks for a smashing day out ! Hi Mark, thankyou so much for bringing your donkeys SALLY and TEDDY to our School summer fayre, the children had a great time and we have some fab photos to prove it! 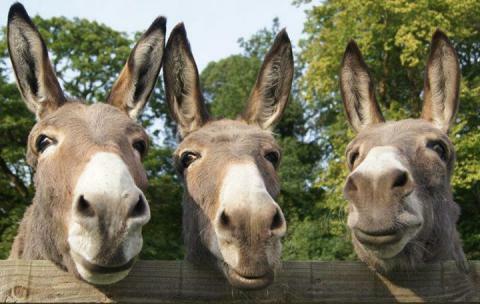 The donkeys made our day really special and we cant wait to see you again next year!! !